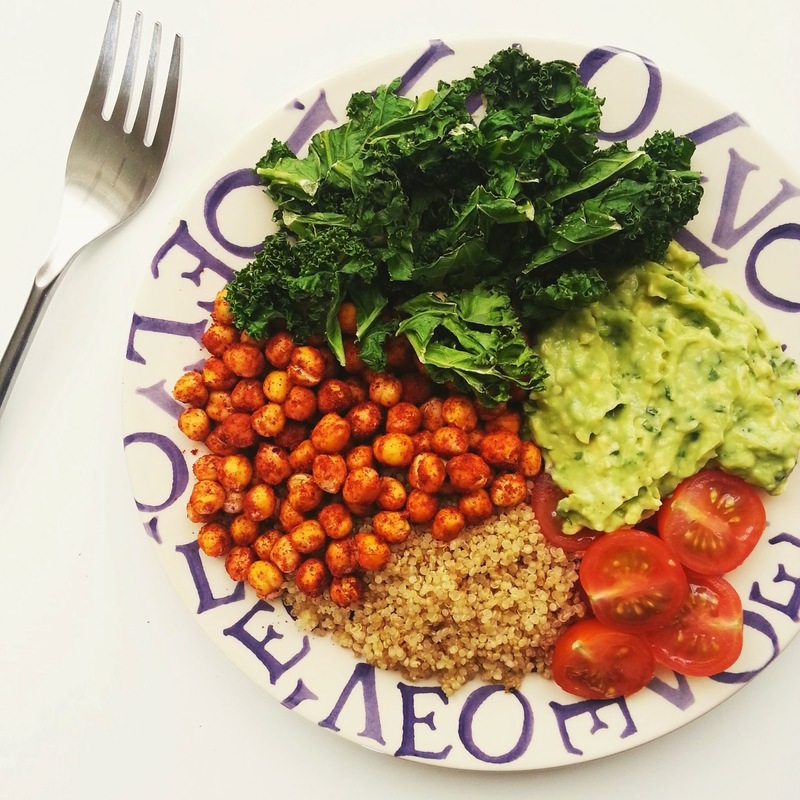 I adore chickpeas - they're so versatile and are great in practically any plant-based main meal. I have absolutely no qualms with eating them plain and in fact I do so on a regular basis, though there are occasionally times when I feel like jazzing them up a little bit; I tend to do this by coating them in spices (such as smoked paprika, in the case of this recipe) and roasting them in the oven until they're crunchy and full of flavour to excite and satisfy my tastebuds. Next to no hassle is involved when making roasted chickpeas so they're a great addition to a simple meal - you can even put them on the same baking tray as these sweet potato or parsnip fries/wedges and eat them together with some crispy kale chips (see recipe below!). Preheat your oven to 200°c then rinse the chickpeas and lightly pat them dry with kitchen towel. Place them onto a baking tray and spread them out as much as possible, then lightly drizzle oil over them until the desired amount has been used - start off with 1 tsp and use more if you want them slightly crispier. Cover the chickpeas in the smoked paprika and massage it all together with your hands until the chickpeas are completely coated. Once the oven has heated up and your chickpeas are ready simply place the baking tray on the top shelf of your oven and bake them for 25 - 30 minutes, or until they're crunchy all the way through (the crispier you want them, the longer you should leave them in there for). Check them after 25 minutes and then every minute or so afterwards. Once they're done transfer them onto a plate or into a bowl and devour them straight away while they're still hot, or leave them for a little bit and enjoy them cold! Preheat your oven to 180°c then wash and de-stem the kale and place it onto a baking tray; spread it out as much as possible and lightly drizzle the oil over it until it's all covered. At this point you can also coat the kale in any seasonings you wish to use - feel free to just eat the kale chips plain though, I usually do! Once the oven has heated up and your kale is ready to be made into heavenly chips simply place the baking tray on the middle shelf of your oven and bake it for 5 - 10 minutes, or until it's crispy. Check the kale after 5 minutes and then every minute or so afterwards. Be careful though because it does cook very quickly and it burns easily. Once the kale chips are done transfer them onto a plate or into a bowl and devour them straight away while they're still hot, or leave them for a little bit and enjoy them cold!